On Wednesday, July 30 at 7pm session 257 of the FBI National Academy held a memorial service at the National Law Enforcement Officers Memorial. The FBI National Academy is a professional course of study for U.S. and international law enforcement leaders that serves to improve the administration of justice in police departments and agencies at home and abroad and to raise law enforcement standards, knowledge, and cooperation worldwide. Two hundred and eleven students came to the Memorial to pay their respects to fallen officers from their departments. During the Ceremony, Memorial Fund CEO Craig Floyd and Supervisory Senior Resident Agent Michael Harrigan, head of the National Academy, made brief remarks, then a roll call of officers from the student's departments was read. Lastly, the FBI National Academy students retook their law enforcement oath. This past Wednesday, Attorney General Eric Holder, U.S. 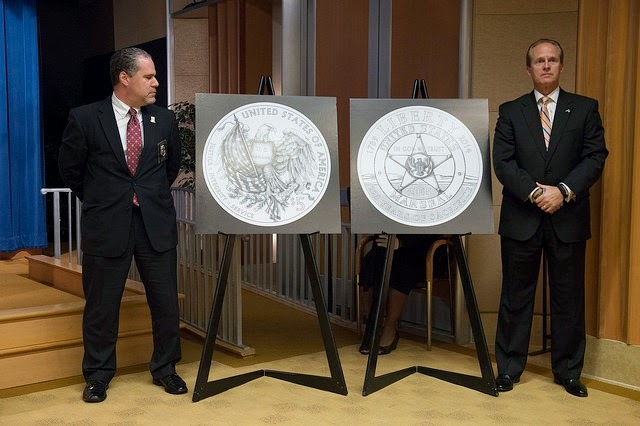 Marshals Service Director Stacia Hylton and U.S. Mint Deputy Director Richard Peterson unveiled the designs of the three commemorative coins that will be sold next year to raise money for a planned $50 million U.S. Marshals Museum in western Arkansas. The coins honor the contribution of the US Marshals Service and will begin selling in January, ahead of the planned 2017 opening of the new museum. Proceeds from the coins will benefit the museum, the National Law Enforcement Officers Memorial Fund and several other charities. The U.S. Mint will produce up to 100,000 $5 gold coins, a half-million $1 silver coins and 750,000 half-dollar clad coins. The $5 coin memorializes marshals who have died in the line of service. The $1 coin honors the agency's frontier history, with the back of the coin showing a U.S. Marshal with a poster that says "Wanted in Ft. Smith." The half-dollar coin focuses on the agency's diverse missions and features depictions of current and past U.S. Marshals. Memorial Fund Chairman and CEO Craig Floyd was in attendance at the event. Left to right: Federal Law Enforcement Officers Association Foundation president Jonathan Adler and Memorial Fund Chairman & CEO Craig Floyd attend coin unveiling event. Sergeant Michael Gainey has worked in law enforcement for the last 12 years. Over those years, the majority of his time has been with the Mint Hill Police Department in North Carolina. Back in 2013, Sgt. Gainey had an idea to hold a local 5K race during National Police Week to raise awareness of their local memorial as well as the National Law Enforcement Officers Memorial in Washington, DC. In just two months, Sgt. 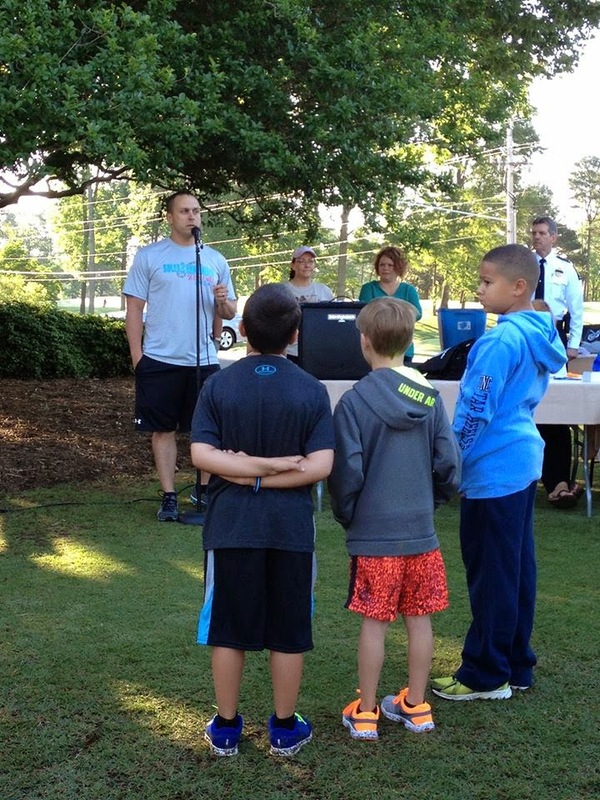 Gainey got the support of Chief Tim Ledford and the Mint Hill Police Department to pull off the first Soles2Remember 5K in May 2013 which raised more than $6,000 for the National Law Enforcement Officers Memorial. Sgt. Gainey and his colleagues came out on their day off to help close streets and bring family members to participate. Along with the support of Chief Ledford and command staff he was able to plan the 2nd annual event, which occurred during National Police Week 2014. This year’s event raised over $7,000 and had more than 130 participants. Sgt. Gainey’s goal for the event is to have it grow to become a family affair in the community of Mint Hill and include other agencies around Charlotte-Mecklenburg. When Sgt. Gainey started the planning process, he contacted us and we encouraged him to become one of our Law Enforcement Ambassadors. He has been doing a great job spreading awareness about our efforts and the work of his agency. Thank you Ambassador Michael Gainey for all your support!